How can opportunities for teaching and learning be improved to ensure that many more people participate, gain qualifications and obtain decent jobs? Will government policies enable us to achieve these goals? What new ideas do we need to ensure a more inclusive, equitable and efficient learning system? 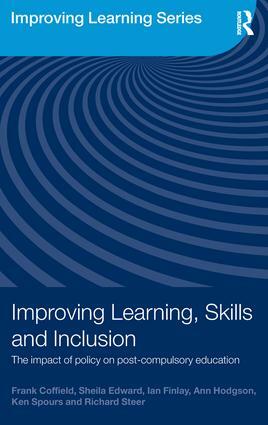 These are some of the main concerns which underlie this thought-provoking book coming from a major research project looking at how policies affect learners, tutors, managers and institutional leaders in Further Education Colleges, Adult and Community Learning centres and in Work Based Learning sites. Post compulsory education in the UK has been constantly restructured by the New Labour government and has been subject to considerable policy turbulence over the last few years. This book attempts to understand this important but poorly understood sector by both talking to students and front-line staff and by interviewing the officials responsible for managing post-compulsory education and lifelong learning. By examining the sector simultaneously from the ‘bottom up’ and from ‘top down’, the authors show how recent policy is affecting three disadvantaged groups - 16-19 year olds who have fared poorly in official tests at school; unemployed adults learning basic skills; and employees at work learning basic skills. The authors conclude that there are serious failings and suggest principles and features of a more equitable and effective learning system. PART I What are the issues? PART II What does the research show? How inclusive is the sector?